Access to a nationwide database list for exchanging fillers. NEW >> View filler samples here! Exchange flyers, coupons, samples, and more with other work at home moms and distribute them with your orders. When you exchange "fillers" with other members, you create your own Mom Packs (advertising packs) to pass out for free however you wish. Just think about getting your business all over the world for FREE by simply coordinating your exchanges! Interactive Email lists for discussion, networking and business promotion - Give and receive business advice and form valuable partnerships with moms in business. An Invite to our Private Members Only Lists for announcing sales, advertising opportunities and more. An Invite to our extra Spin-off lists including a goal buddies group, a "talk about anything" chat group, a healthy moms list, an ebay sellers list and much more. Get a wish granted or grant one of your own on our members only Wishes group. Click here for details. This one is a fun one! Every October through January, we open a special Holiday Interactive List just for members to share non-advertised specials for our members to get their holiday shopping done and save some money! Discounted Merchant Account of your very own to process credit cards without having to use a 3rd party high rate service. Offered as a special Mom Pack member discount through First Data. This is not an affiliate thing! We are recommending something that we are personally using ourselves. Need a dependable web host? We also own and operate our own web servers. No need to worry every day whether your affiliate or reseller is going to be around the next day! We're moms too so we know the importance of server uptime. Hosting is the heart of your entire business! We offer special Mom Pack member discounts. Grab a coupon code! A listing in our Mom 2 Mom Business Directory - Our directory allows Mom Packers to support one another in business. Access to our Mom Pack Message Boards where you can meet and support each other through a variety of subjects. Boasting over 28,000 members. Free printables! Lots of them! Free listings for your contests - List your ongoing and time-limited contests. (Weekends Only) Note: All postings must have no requirement to signup to a mailing list to win. 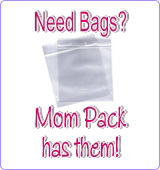 An opportunity to join the Mom Pack Webring - Bring traffic to your website simply by placing a graphic on your website. Join us today! It's free! CLICK HERE Note: This is a very active list of members. Last check, we were at over 8,500 members interacting so it can get overwhelming quickly. But, don't worry. You can set your mail receiving preferences to whatever works best for you. Try us out. It's free. You'll need to wait for approval - we monitor everything for the safety of our members! And... there will be more! We are constantly checking out great additions to add to our member benefits package.